Considerable research effort has been spent to understand why most organisms disperse despite the clear costs of doing so. One aspect of dispersal evolution that has received recent attention is a process known as spatial sorting, which has been referred to as the “shy younger sibling” of natural selection. Spatial sorting is the process, whereby variation in dispersal ability is sorted along density clines and will, in nature, often be a transient phenomenon. Despite this transience, spatial sorting is likely a general mechanism behind the evolution of nonzero dispersal rates in spatiotemporally varying environments. While most often transient, spatial sorting is persistent on invasion fronts, where its effect cannot be ignored, causing rapid evolution of traits related to dispersal. 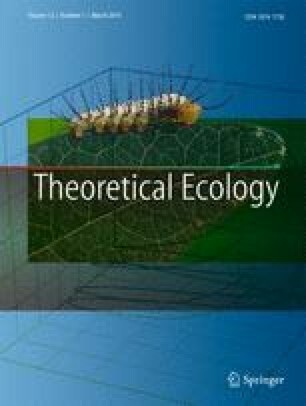 Spatial sorting is captured in several elegant models, yet these models require a high level of mathematical sophistication and are not accessible to most evolutionary biologists or their students. Here, we frame spatial sorting in terms of the classic haploid and diploid models of natural selection. We show that, on an invasion front, spatial sorting can be conceptualised precisely as selection operating through space rather than (as with natural selection) time, and that genotypes can be viewed as having both spatial and temporal aspects of fitness. Viewing fitness in this way shows that, on invasion fronts, organisms maximise spatiotemporal fitness, rather than traditional (temporal) fitness. The resultant model is strikingly similar to classic models of natural selection under gene flow. This similarity renders the model easy to understand (and to teach), but also suggests that many established theoretical results around natural selection could apply equally to spatial sorting. The manuscript was improved by thoughtful comments from Stephan Peischl, Susan Frances Bailey, and Frédéric Guillaume. BLP was supported by the Australian Research Council (DP160101730, FT160100198).